Herman Yau’s (邱禮濤) action-packed The White Storm <掃毒> film series is back with a second part, this time with new cast members. 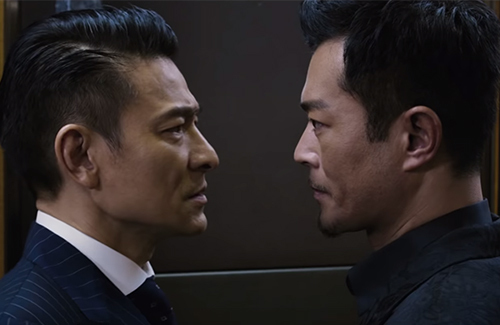 The film, subtitled Drug Lords or literally “Heaven Hell Face-off” <天地對決>, stars returning cast member Louis Koo (古天樂) as a powerful drug leader going head-to-head against new cast member Andy Lau (劉德華), playing a gangster-turned-financial tycoon who puts a HK$100 million bounty on the most powerful drug cartel in Hong Kong. Though they represent “hell” and “heaven” respectively in the subtitle, Louis and Andy’s relationship is not as black and white as it seems to appear. Also starring in the film is Michael Miu (苗僑偉) as the chief superintendent of police, with Karena Lam (林嘉欣), Kent Cheng (鄭則士), Charlie Young (楊采妮), and Chrissie Chau (周秀娜) as supporting. Drug Lords is slated for a theatrical release in July. @llwy12 he already not young. Why not act as much as possible now to earn more cash so that can live comfortably and extravagantly after 60 age? nevertheles, now the entire hk film is still supporting by Andy lau, chow yun fat, louis, aaron, and sean lau. 15 years later all will be old. @llwy12 He really is in everything. Very impressive. On Wikipedia, his list of pending films is more than some people’s entire careers. I was amused by that too.